Start with bone-in or out, well-marbled beef. Bones don’t add flavor, but they do regulate temperature, increasing the amount of tender, medium-rare beef you’ll get in your finished roast. And, of course, you get to gnaw on those bones when you’re done. Marbling is intramuscular fat that appears as a white, pattern within the meat. The more marbling, the richer and more tender your beef will be. Though most guides recommend a pound per person when you’re shopping for prime rib, this is for very hungry eaters: You’ll most likely get away with three-quarters of a pound per person, or about one rib for every three people. The Prime Rib to the Right is a 16 lb CAB (Certified Angus Beef) roast. Finish on the Grill. 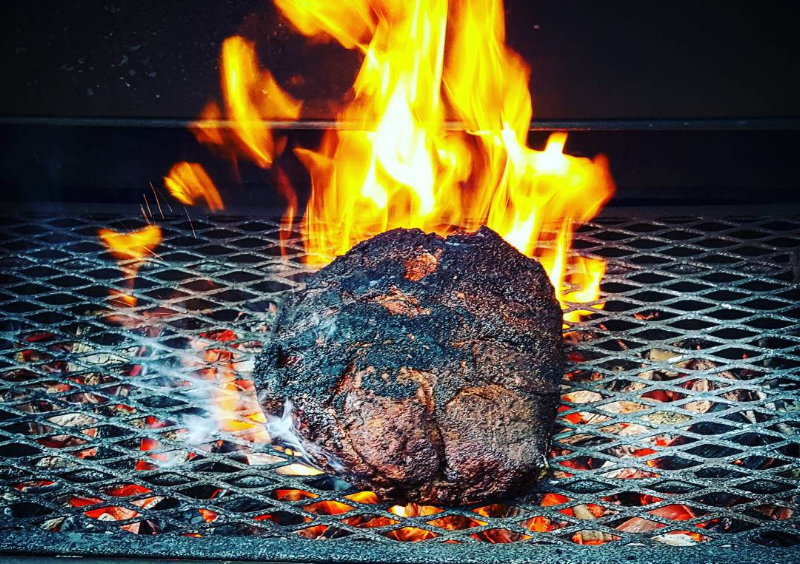 Remove the roast, from the smoker and move down to the charcoal grill of the smoker, set the beef back inside for just a few minutes to crisp up the exterior, while rotating top and bottom every 2 minutes. Do have a good set of heat gloves to move the roast. The result is prime rib that is measurably juicier and tenderer, with a crackling crust and the biggest expanse of rosy interior.